This last week Hurricane Harvey hit the Texas Coast causing severe damage. The devastation was not over after the initial hit. Tropical Storm Harvey continued to unleash historic amounts of rain for several more days in the Houston area. It transformed streets to rivers and low-lying areas to lakes. Watching the reporting was heartbreaking, as human victims struggled to find shelter and safety. Unfortunately, with the quick rise of water, many pets and animals had to be left behind. However, there was a bright spot during these cloudy days, as the remarkable stories of generosity began to surface. Texans and Americans from across the country were mobilizing to help displaced victims in their time of need. However, generosity did not only extend to the human victims, but also to the many pets that were abandoned and lost during the storms. 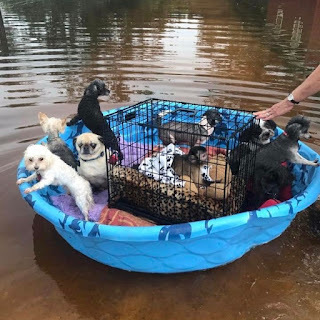 Rescue groups and animal care organizations from all over the country came to help save and rescue the animals. Truckloads of shelter pets were transported to other states to make room for Harvey pets in the hopes they will be reunited with their families. Many pets have been reunited and others are receiving veterinary care, food and shelter while they wait for their owners or adoption. Texans have shown unprecedented care and concern for the animals. Thank You to all the First Responders, Animal Rescue and Welfare Organizations and Volunteers that put the needs of others above their own!